Was Israel specifically expecting Yahweh to take on flesh so as to fulfil His promises? Graham Cole was in for a surprise when he set out to answer this question in the latest volume in the New Studies in Biblical Theology series. Cole expected to follow the theme of the incarnation from Genesis to Revelation but soon realised that “the incarnation per se was not explicitly part of the Old Testament hope” (11). Foundations for the doctrine, however, were present, just waiting to be unearthed in the light of Christ’s coming. When we read the Bible backwards, knowing what we do, we can see incarnation as early as Genesis 3:15. However, when reading the Bible forwards, it appears that the incarnation was not explicit or observable. Undaunted by his acknowledgement that the incarnation is only truly seen backwards, in The God Who Became Human, Cole specifically attempts to trace the theme by reading forwards to see how “the incarnation was prepared for” in the Old Testament. This preparation includes human (anthro-) language being used of God, theophany, and the incarnation as escalation of God’s presence among His people. In the first three chapters, Cole explores incarnation in the Old Testament. Beginning with identifying Eden as the (temple and palace-like) dwelling place of God, we see that the Lord intended creation itself to be His dwelling place with man. God is also described as ‘resting’, ‘planting’ and ‘walking’, and here Cole helpfully introduces the concepts of anthropopraxism (action), anthropopathism (emotion) and anthropomorphism (physicality) as tools for distinguishing the different ways that Scripture describes God in human language. The fall of humankind, and messianic expectation beginning in Genesis 3:15 are discussed. God’s dealings with Abraham and the patriarchs find the same themes emerging, with Cole spending a significant amount of time on theophanies – God appearing in human form – in texts such as Genesis 18-19, 32:22-32 and others. However, did Israel expect God’s promises to be fulfilled through God taking on flesh? Do we see passages such as Psalm 45:6, Isaiah 9:6, Daniel 7:13 and Psalm 110:1 pointing directly to a divine Messiah? Opinions on both side of the issue are represented, and the passages themselves are examined. After dealing with the texts, Cole ends up disagreeing with those like Warfield and Ortlund Jr. who see such passages as clearly pointing to a divine Messiah, instead finding in the texts themselves too much ambiguity and lacking the necessary Christological illumination found in the New Testament. Cole does sees a typological reading found in Carson’s Jesus the Son of God (my review) as a potential way forward, bridging the Old and New Testaments and providing insight as to how the NT authors, such as that of Hebrews, presented ambiguous OT texts as fulfilled in Christ (Heb 1:5; 1:8-9). However, Cole finally concludes that, “no expectation of an incarnation is plainly in view in the pages of the Old Testament” (91, my emphasis). The next three chapters deal directly with the incarnation itself (chapter 4), the purposes for the incarnation (chapter 5), and the significance of the incarnation (chapter 5). Firstly, Cole examines Jesus’s own self-understanding (eg. Luk 24:27; 24:44), and that found in Matthew, Mark, Hebrews and John. While these texts reveal the incarnation, they don’t reveal an expectation that the Old Testament writers and readers anticipated the incarnation, since it is a mystery (1 Tim 3:16). 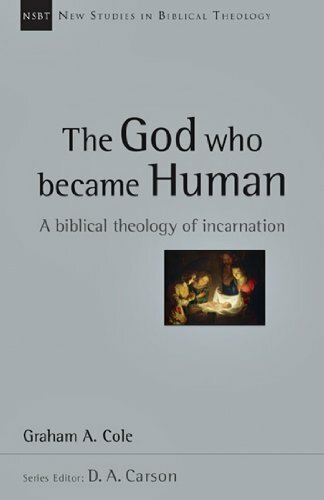 Rather, following Wolterstorff, the Old Testament provides background “beliefs that were crucial for the intelligibility of an actual incarnation” (114). Next, Cole proposes six reasons for the incarnation according to Scripture. Lastly, the theological and existential significance of the incarnation is discussed in detail. The insights in these last two chapters are too broad to summarize in this review. There is much to appreciate here. It is commendable that Cole patiently walks forward through the Old Testament texts, letting them speak for themselves, without jumping prematurely or illegitimately connections with Jesus only fully revealed in the New Testament. This makes Cole’s approach unique in that many Christians are used to reading the Old Testament in light of Christ (as we ought! ), but Cole shows how it is beneficial to experience the Old Testament as its original hearers and readers would have, to better appreciate the ‘surprise’ of the incarnation. Cole’s main insights on the foundations for incarnation in the OT (human language, theophany, and God’s dwelling with man) are quite illuminating. Together these threads appear to be a good starting place to see the incarnation prepared in the Old Testament. Cole ably pulls these threads together to form a tapestry of OT foundations, albeit not expectations, for the incarnation. I was also grateful that Cole took the next logical step to seek systematic and practical implications for the incarnation. Some will balk at this idea, but it is fitting since this study provokes a number of related theological questions that must be addressed, and Cole’s skills as a systematician are fitting. Theophany could have been expanded to discuss the possiblities of Melchizedek in Genesis 14, nor of the Angel of the Lord in Joshua 5. The section on Jesus’s self-understanding was a little lacking. Cole says that Christ presented Himself as fulfilling Old Testament predictions, but doesn’t really get into the issue of whether Christ understood Himself to be preexistent. However, if Christ understood Himself as preexistent then would this not imply a clearer presentation of incarnation in the Old Testament than Cole recognizes? For example, if the heavenly Son of Man in Daniel 7 was not clearly messianic (86-87), then how did Jesus come to the conclusion that He is the Son of Man? Was it purely divine revelation? Irrespective of the fact, wouldn’t using this title of Himself imply preexistence, and therefore incarnation? Simon Gathercole argues from Christ’s “I have come” language in the Gospels that Jesus was conscious of preexistence, but unfortunately Cole didn’t engage with Gathercole’s The Preexistent Son. While this is a relatively small piece to the book’s puzzle, these omissions are unfortunate since they do have a bearing on how the Old Testament does or doesn’t predict incarnation. There is a fairly small treatment (2 pages each passage) on the verses used by Warfield and Ortlund Jr. (Ps 45:6; 110:1, Isa 9:6, and Dan 7:13) to defend a clear OT prediction of incarnation. Since these texts are quite important to the topic, I would have appreciated more depth. Cole helpfully represents the views of those such as Sailhamer who don’t recognize theophany, rather seeing the three men in Genesis 18 as merely representative messengers of the LORD. Considering that theophany is very important to Cole’s case, it’s unfortunate that not much space is given to refuting those who deny it. Articulation of Cole’s own views on texts are quite scant. Not just in Genesis 18, but in other sections, such as the account of Jacob wrestling the “angel” and Cole’s view of the earth as a temple. To be thoroughly convinced of these views, we must look elsewhere. Cole makes some great insights and helps brings together varied themes in one cohesive presentation. I would definitely recommend this book to anyone interested in the topic, but an in-depth study would probably need to be supplemented with other books, which is always a good thing to do anyway, but particularly so here due to its brevity. Ultimately, The God Who Became Human stimulates deeper reflection on the Scriptures, particularly in regards to Old Testament themes that form a foundation for the incarnation and God’s purposes in taking on flesh for our redemption. What a wonderful mystery, God with us!